With so many trends and devices predicted in terms of technology for 2014, this development caught my eye straight away. I remember reading at the end of 2012 all of the predictions meant for last year, some which did not quite pan out and while the new year has just started, it is still debatable whether 2013 was actually a successful year for tech, after all wearable watches did not exactly set the world on fire did it? The educational sector is not immune to innovation and education technology in particular has been experiencing some very significant advances and Swivl is one tech startup, that has been quietly shaking things up in the educational space, in my opinion. Definitely one to watch folks especially given MOOC’s rising importance. Founded by Brian Lamb and Vladimir Tetelbaum, veterans of the product design industry in 2010. Swivl is backed by Grishin Robotics, Innovation Works and Kima Ventures. Their mission? – to connect every classroom and conference room using video that improves collaboration. Why did Swivl trend last year? Their iPhone-ready hardware incorporating a target sensor which, if worn by educators, could deliver videos that could lead to disruption in the way education is delivered and also where attendance isn’t mandatory. Already coined ‘flipped education’, Swivl offers a new learning paradigm in education where the core teaching materials can be pre-recorded and studied at a remote student’s own pace. Taking things a step further, the start-up have engineered, what they are calling the Swivl Cloud, a connected service for its robotic mobile accessory for creating and hosting learning video content. The service is a companion to the firm’s 2nd-generation robot designed for mobile devices. On examination, the Swivl Cloud platform provides a seamless solution for instructors to create, manage, and privately share their own video content. 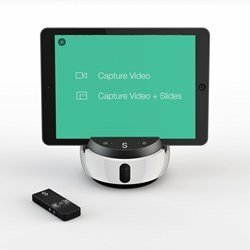 The Swivl Capture application for iOS and Android devices is designed with video capture and playback features and the capability for embedding things like slide and presentation decks. (another killer feature) The newly designed Swivl Robot accommodates all iOS and Android tablets and smartphones, as well as handheld video cameras, with an all-new form factor that retains the functionality of the original Swivl to track and follow your every move. It is interesting that thus far, the device has been used for a wide variety of different uses, ranging from corporate telepresence to pet monitoring of all things, but has been a big hit within the educational sector in particular. Swivl will shortly sponsor TransformingEDU (formerly HigherEdTECH) next week at the Consumer Electronics Show (CES) 2014 from January 7-10, 2014 in Las Vegas.